This will be my last hair product post for a while (famous last words), because there's only so much my scalp can take and I need a bit of a detox. That said, I've tested and used many incredible hair products lately, several of them will become regular items in my rotation. However, Arganesse Hair Treatment is not likely to be among them. Arganesse Hair Treatment is a very luxurious hair product. It comes in a heavy glass bottle wrapped in a green velveteen pouch and has a nice fragrance (a floral musk with a hint of hairspray, perfect for hair). The bottle doesn't have a pump, instead your pour the liquid into your palm and run it through you hair, contributing to the general feel of a vintage hair product. I like it a lot. As for performance, Arganesse does what it says: it detangles and de-frizzes, imparts a nice shine and helps keep long hair manageable. Here's the thing: Arganesse is enriched with argan oil and Vitamin E, and has very few ingredients. However, most of the content is good old silicone. We all know that liquid silicone works. It's in a huge amount of commercial hair products for a good reason. But it's still silicone, not argan oil. My scalp happens to be very sensitive to some silicones, but that's not a problem. I know how to keep the treatment strictly on the hair and away from my scalp. I just don't like it when they try to sell us good ole' cone as something totally new and amazing (with the price tag to go. $120 for 3.4 oz in this case). Ingredients: Cyclopentasiloxane, Dimethicone, Argan Kernel Oil, Tocopheral Acetate (Vitamin E Acetate), Fragrance. Arganesse Hair Treatment ($120, 3.4oz) is available from arganesse.com. The product for this review was sent by PR. 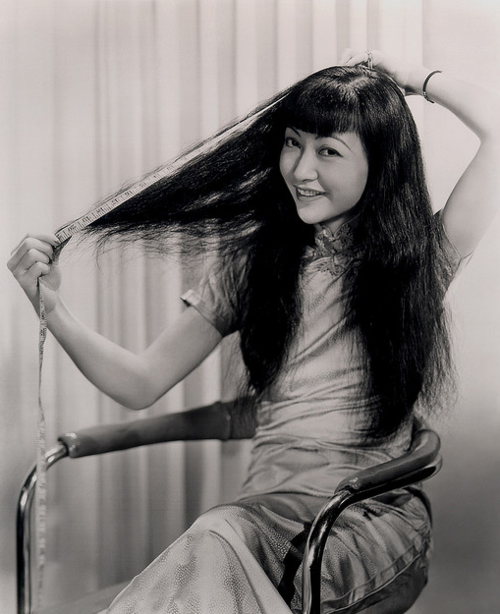 Photo of Anna May Wong via Stirred, Straight Up With A Twist. A ha! glad you got to the bottom of it. Glad you are testing giving out the hair secrets. I have been doing well with Klorane lately. Great post! I have heard about this product but I was kinda hesitant to use it for it contains silicone. I guess I have to pass on this one for safety. I can purchase 4 oz. of cold-pressed, unrefined Argan oil from a trusted source for a little more than $25. Why would I ever buy Arganesse? Thanks for exposing these frauds.